25 Days of Glam with the Revolution Advent Calendar! With Christmas just around the corner, and socials and parties filling our schedules, what could be better than being treated to a new makeup item on each day of December! Making an amazing alternative to chocolate, Makeup Revolution’s advent calendar retails at a very reasonable £30, and contains 25 pieces: working out at only £1.20 per product. 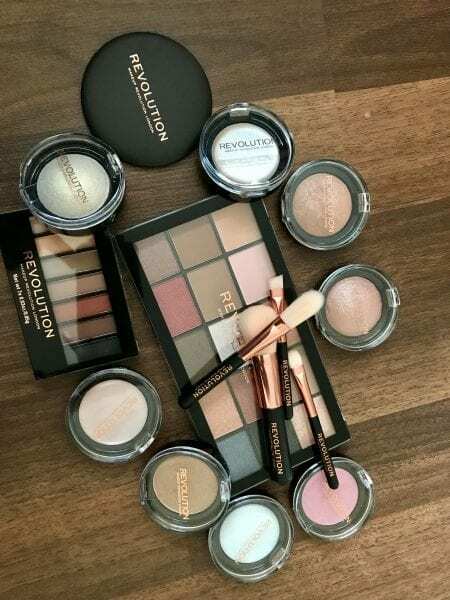 Makeup Revolution are a budget makeup brand who have had a monumental year, being praised by many high profile Youtubers for their affordable concealer that was compared to the likes of NARS that retails at almost five-times the price. Surrounding gleaming reviews of this advent calendar, I got my hands on this glitzy product to put these bargain products to the test. Firstly, there are an abundance of eye shadows behind the doors, which are ideal for creating a perfect christmas look, appropriate for any occasion, with any level of skill. Notably, there is an eye primer included, which has been a key product this year, necessary to prep the eyelid in order to build and create the perfect base for shadows to be applied upon. Furthermore, the calendar contains a premium looking palette made up of both matte and neutral shades which were great for blending: perfect if you wanted to create an everyday, smokey look. Yet, if we are feeling more adventurous this festive period, there is another eyeshadow palette of 15 shades included, suitable to create a heaviler glam look as it contains an array of matte, foiled and glittery shadows. Highlighters certainly have the power to make or break a look, and fortunately this advent calendar contains different formulas and colours to suit everyone! Revolution have treated us to 3 creamy formulas, 2 powders and 1 liquid highlighter hiding behind the windows. Personally, my favourite had to be the cream highlighter as they are buildable. The highlighters are versatile and can be applied to give either an intense or subtle glow and are therefore suited to everyone’s personal taste. In terms of contouring, there are 2 bronzers included in the set which come in two dark shades. I would usually prefer a matte bronzer but the ones included have a subtle hint of glitter which does give the skin a healthy, dewy finish. 8 lip products are also available within the calendar; in an array of 6 satin lipsticks and 2 glosses. The lipsticks come in staple colours, from nudes, to subtle pinks and ravishing reds, perfect for adding a touch of colour to a simple look. The formula of the products is fairly pigmented for such a low price, and quite surprisingly doesn’t feel greasy or uncomfortable. To further enhance your look, I would suggest to add a touch of gloss on top of the lipsticks, as they contain a notable non-sticky formula. However, something I wish that they included would be a lip liner as it is hard to get a complete, neat look without one. In addition to all the products I mentioned before, there are 4 brushes included and 1 mirror to top off the collection. Although the brushes are fairly small, they are incredibly soft and work well to distribute the products. If I’m being picky I felt it was a shame that Revolution didn’t include one more blending brush as it would be hard to apply a sufficient transition shade with any of the brushes that are included. Overall, I believe that Makeup Revolution’s advent calendar is a thoroughly good buy, and is a perfect gift for any makeup lover in your life. Given its incredibly reasonable price, it’s a no brainer, as you are able to test out a variety of great products without breaking the bank. My personal favourites are certainly the eyeshadow palettes, as the the colour options give you a versatility that is a lot greater than I expected for £30, and I was able to make an endless combination of looks. It’s Christmas, treat yourself!